A common thread that runs between IT and innovation in general is that new ideas require change. As Chip Heath said at the World Innovation Forum in June ’10 (that’s him above): change is hard, it can be futile and most people resist and hate change. 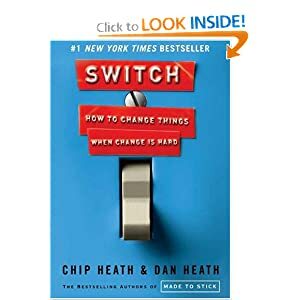 Chip and his brother Dan have written two books, the second one is Switch: How to Change Things When Change is Hard (disclosure: I received a free copy at the conference). Cloud computing is a big and potentially scary change, how is the industry doing at creating the correct environment for customers to undertake the new products and services? At VMworld, “The Cube” will be broadcasting LIVE and digging deep into this topic – see all the details on SiliconANGLE and be sure to tune in Aug 30-Sept 2 for executives, customers, bloggers and analysts. “A long journey starts with a single step.”… But you know what else starts with a single step? An ill-conceived amble that you abandon after a few minutes. The theory of Switch is that when change works, it follows a pattern. There are three pieces of the pattern which they describe as The Rider, The Elephant and The Path. The Rider is analytical and works well with concrete examples to follow, a technique discussed is following “bright spots”. These are not happy thoughts, but finding successful results and replicating and amplifying them. What may look like resistance to change may simply be cluelessness of not knowing which direction to go, so scripting the first steps will help get people on the right track. This is similar to getting the low hanging fruit – what is the one thing that can be done or changed that get people moving in the right direction. An example in the book was a campaign to get people to switch from whole milk to 1%. It is a simple change that dramatically lowers the daily fat intake and compared to the food pyramid, it is easily understood and followed. On the analytical side, customers are confronted with a lot of information about cloud computing, but it is often difficult to distinguish between vision and reality. Plenty of companies are utilizing public cloud offerings and this puts internal IT organizations in the position of having to be competitive with the flexibility and costs that their lines of business can get directly from the cloud. When it comes to fully virtualized solutions, the analytical customers are still asking a lot of questions about security and management. As for scripting the critical moves, turnkey solutions and integrated stacks have been coming to market, allowing customers to deploy virtualized data centers or private clouds. The Elephant is the automatic reaction and emotional side. The voice of the elephant tells you to eat the entire quart of ice cream, that you must check email constantly and when it comes to change *THAT’S WRONG*. In trying to create a major change, the action is not Think > Analyze > Change, but rather See > Feel > Change. A recommendation for the emotional side is to find the feeling that will allow people to see and connect with the change. Another method of motivating the elephant is by shrinking the change, breaking it down into pieces that aren’t as scary and get the snowball rolling towards the ultimate goal. In order to avoid spooking the elephant, people must understand that change is a journey that will have peaks and valleys – “rarely a graceful leap from heigh to height” – and that if failure and challenges are listed as an expected part of the journey, that people will be less likely to give up when there are challenges. Cloud computing has a way to go on the emotional side. Many IT practitioners still have the elephant voice telling them that cloud = no job. There are plenty of ways to create bite-sized changes along the path to cloud such as deploying a single application (take backup as an example). I’ve yet to see anyone embracing failure as part of the deployment of cloud computing, but would love to hear from customers about learning experiences that they’ve had in this regard. I’d read plenty in sales and business books dealing with emotional and analytical positioning, but Shaping The Path was new to me and resonated strongly. Chip said that we often have a fundamental attribution error – that is we focus on people rather than situation. As an example, if a car cuts you off on a highway, we blame the person, not the situation (which could be the road itself or extenuating circumstances that causes the person to be driving more reckless than they should). Shaping the Path can be done through adjusting the environment, building habits or “rallying the herd”. An example given for tweaking the environment was to give software engineers “quiet hours” (or what EMC called the “cone of silence”), specific times where they would not be interrupted and could focus on their job without having to feel guilty for not checking email, answering calls or otherwise being distracted from their primary job. As part of building habits, Heath advocates that checklists can help people from becoming overconfident. People think that having a checklist means that you can’t remember or don’t know your job, when it is can be a reminder of the mission-critical things that must be done and help avoid mistakes. “So before you conclude that your husband is hopelessly absentminded, always forgetting to pick up the dry cleaning and the milk, maybe you should try shaping his Path. How about taping a checklist to his steering wheel?” Finally, rallying the herd is about allowing reformers to have a space to discuss their change plans and let the environment become contagious. Rather than completely separating reformers from resisters, Heath advocates going through an “organizational molting” so that the new culture takes over. Doing a search, I see that there are plenty of Cloud Computing checklists – has anyone found any good ones? Industry conferences can often be a great place to rally the herd and as I mentioned earlier, the live broadcast on SiliconANGLE will highlight those customers who can share “next practices” for cloud computing. One of the funniest things that Chip Heath said was that most people think that change is really hard, yet the #1 and #2 most stressful and challenging changes in people’s lives are sought after and embraced. Getting married (#2) and having children (#1) are a more dramatic change than any merger and acquisition or industry shift. Sure there are plenty of challenges in implementing cloud computing and other innovations, but with a good pattern to follow, the journey can be undertaken intelligently. You are currently browsing the Blog Stu - Stuart Miniman blog archives for August, 2010.